Enjoy the KFC Original Crispy Strips? Here is the recipe. It is the same as the Extra Crispy chicken recipe. The soft chicken flesh and addictive flavor is something you could not missed. When you want a quick, easy hit of KFC, you want Crispy Strips! For those who enjoy cooking like i do, why not prepare this for your family or friends for any occasion. Childen will love it. Especially when its home-made. But if you have no time to flex your deep-frying muscles with these recipes, i would suggest you to hit the nearest restaurant and order. Using a sharp knife, cut 6 chicken breasts into strips, or you can buy chicken tenders at the supermarket; there are ready ones available such as chicken fillet. The chicken strips should not be too thin or too thick. Marinate the strips overnight with garlic, pepper, paprika and salt. Preheat the shortening in deep fry to 350deg or preheat vegetable oil in deep fry to 175 deg. It takes a lot of oil to deep-fry, and it’s best to start with fresh oil every time. In meantime, beat one egg and one cup of milk. Dip the chicken into the egg mixture and coat the chicken delicately into baking powder. Once the oil has reached the desired temperature, fry in fryer a few at a time (or try one first to test the heat) till they are golden brown. It should be around 5 minutes. Be careful not to crowd the oil with too much strips: crowding will cause the oil’s temperature to drop dramatically, which will result in a greasy product. Crowding will also increase the likelihood that the fried bits and pieces will stick to each other. 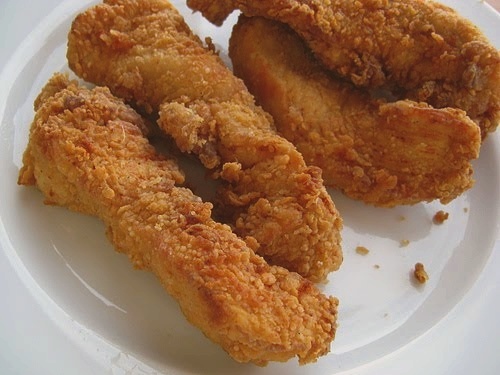 Once the chicken strips are golden brown, use a slotted metal spoon or spatula to remove the cooked chicken and let them drain on paper towels or cooling racks. Enjoy chicken strips with your prefered sauce. The recipe calls for 2 cups of all-purpose flour but i do not see it being added. Is the baking powder supposed to be added in the all purpose flour?